Are you frustrated due to an incomplete answer of delete or uninstall Apple watch app from iPhone? Get everything about on it here. The tech-giant Apple allows installation of third-party apps for Apple watch. So you can install compatibles Watch OS apps and if you wish to remove it then you can delete it, too. The Apple Watch has comes with several essential built-in apps like Messages, Mail, Phone, calendar, Activity, workout, Siri, Remote, Music, Alarm, photos, Settings, timer, Stocks, Weather and other apps. So as like iPhone, you can hide app, but can’t delete built-in Apple Watch app. in addition, you can do remove third-party Apple watch apps. Therefore, If you are annoying from unwanted and less use Apple watch apps on Apple watch home screen. Then follow below way to deleting or uninstall Apple watch app steps wise. Step 3. Now scroll the screen and tap on app that you want to remove. Step 4. 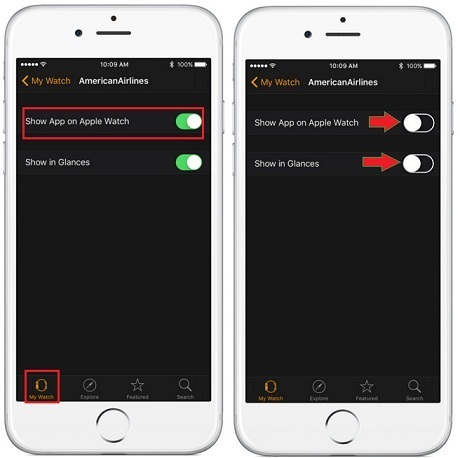 Now flip a switch and make Turn off Show App on Apple watch. You can also delete by Tap and hold on App on Apple watch and tap on X mark. That will be asked you- Are you sure want to delete (App name)? Tap on Delete App. That’s very easy. So virtually, hope you get here guide that you are really looking for. Keep remember, you can apply this trick anytime if you want to see app on your iPhone and don’t want see on Apple watch. Then without searching anywhere, just continues above steps order wise. Therefore, now you can remove any possible application from apple watch. Please share your thought or have any special trick to delete or uninstall Apple Watch app from iPhone. We would love your speech. Furthermore, Stay connected with us to get daily new how-tos trick and tips iPhone 6S/6, iPhone 6S/6 Plus, iPhone 5s/5.